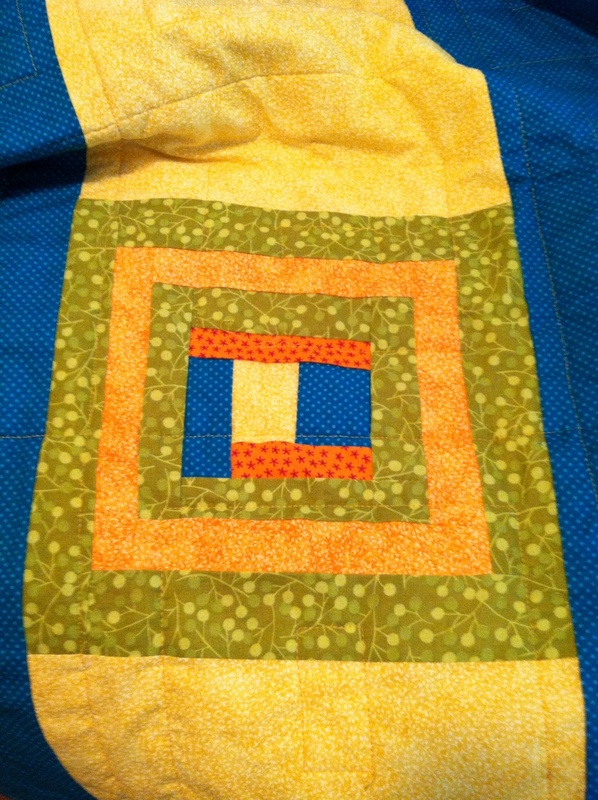 For the past two days, I have quilted the quilt. 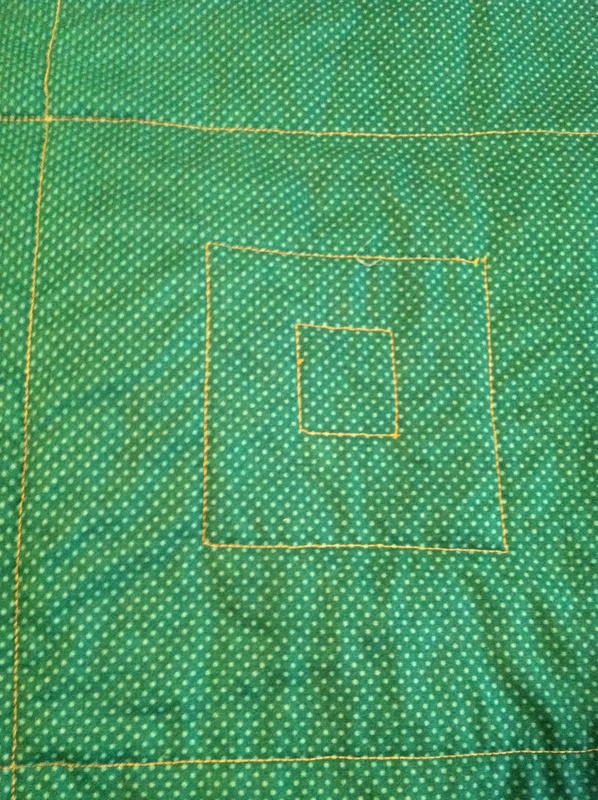 It actually only took a couple of hours…I decided to stitch in the ditch around each square first. 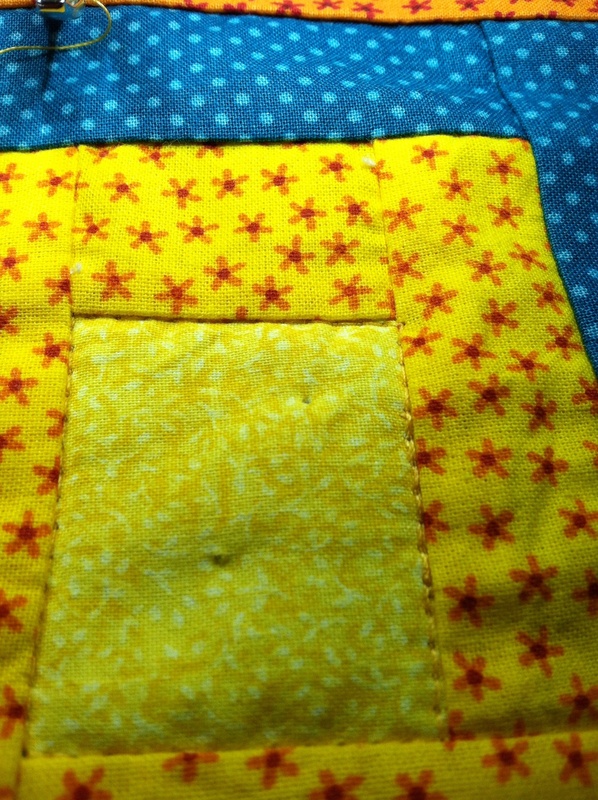 Then, after looking over the quilt, I thought it would look nice to stitch around the the yellow central blocks and then stitch around one of the log cabin squares about halfway into the square. Here is how it looks. 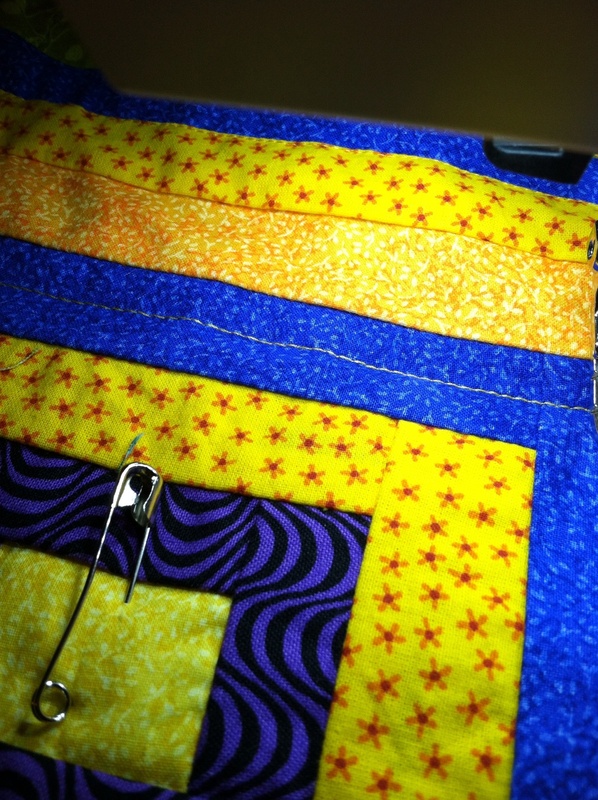 Note that the curved quilting pins I bought are too big and left holes in my center squares. I’m hoping when I wash the quilt they will look better. 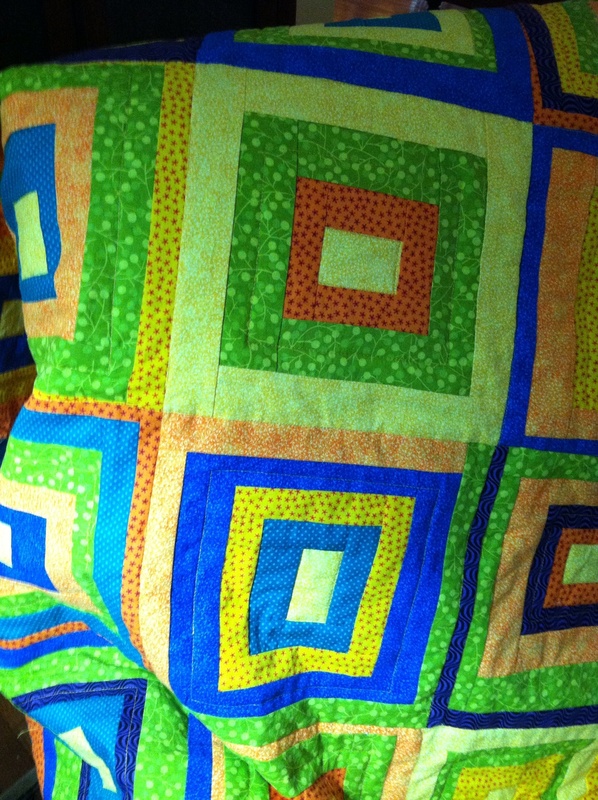 When I turned the quilt over, there were nice quilted squares all over the back. It didn’t seem to matter that they ran through the back design at different intervals. Here is the quilt. The light isn’t too good. I need to get a brighter one for these pictures. One other thing, the spray basting seemed to work well. 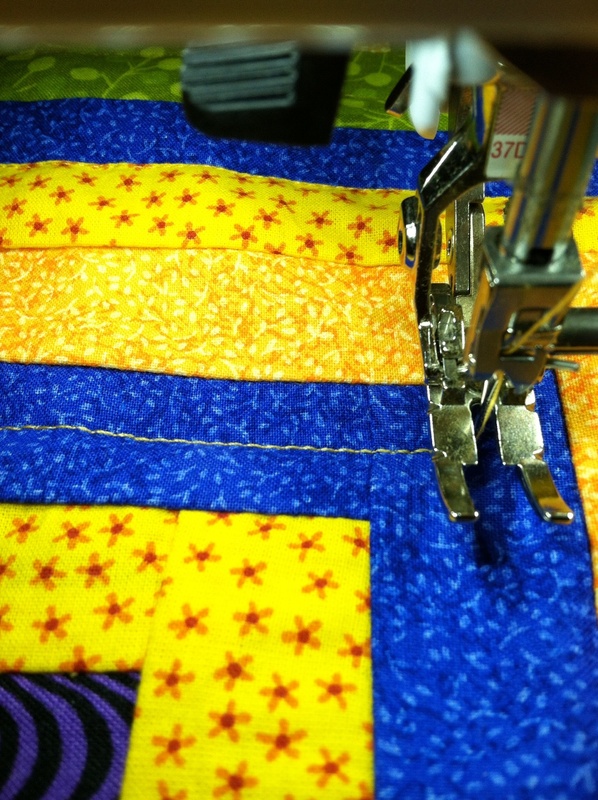 The quilt was easy to move around and it stayed in place as I quilted. I believe I will buy some thinner curved pins and continue to use some in case the spray doesn’t hold after a few days. So, tomorrow I will square up the edges, cut the binding strips and bind it. This entry was posted in Uncategorized and tagged Beginning quilting, Log Cabin quilt, Modern Quilting, Quilt Sandwich, Wonky Log Cabin. Bookmark the permalink. Thanks, I still have a long way to go. Next, I’m going to practice FMQ. That should be a riot.